Catherine Barley welcome to my website. PERSONAL PROFILE. Please respect that all photographs on this site are protected by copyright and may not be used freely by visitors to the site! Catherine Barley is a tutor of international renown, has been teaching bobbin lace, needlelace and stumpwork both at home and abroad for over 40 years years and is a qualified teacher in Adult and Further Education. Her book ‘Needlelace Designs and Techniques Classic & Contemporary’ first published in 1993 by BT Batsford and re-printed four times is now sadly out of print. Her work has been exhibited in major exhibitions in the UK and overseas. She was awarded a silver medal and diploma for her lace panel ‘The Snow Queen’ at the VII International Biennial in Sansepolcro, Italy in 1998. The theme for this exhibition was ‘Lace as Poetry’ and her panel was described by the judges as ‘A Beautiful Dream’. 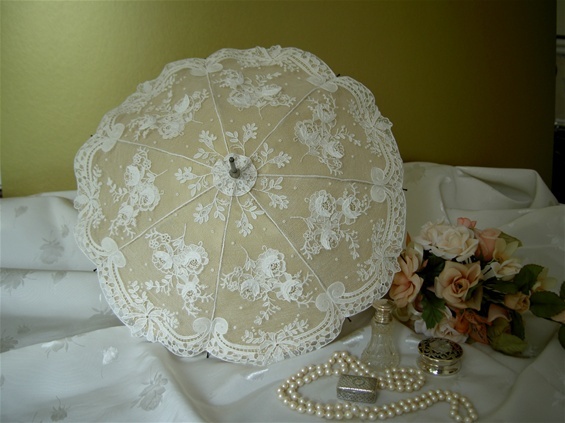 Her ‘Parasol For Iris’ was awarded a Medal of Excellence by The Lace Guild in 2007 and she is currently Life President of The Guild of Needlelace having been their inaugural Chairman when the guild was first formed in 1983. NB. HAVING BEEN OUT OF PRINT FOR ELEVEN YEARS 'NEEDLELACE DESIGNS & TECHNIQUES' IS ONCE AGAIN AVAILABLE AS A SPIRAL BOUND, PRINT ON DEMAND EDITION, PRICED AT £26.50P. DETAILS ON HOW TO ORDER YOUR COPY CAN BE FOUND UNDER 'SALES/ORDERS'. In the late 1960's Catherine saw a demonstration of bobbin lace at a Church Hall in Crowthorne, Berks where she used to live. She stood for some considerable time totally fascinated by the bobbins and intricate patterns being worked and wondered where she might learn. The lady demonstrating was none other than Nenia Lovesey and that chance meeting totally changed her life. Catherine enrolled in Nenia's class at The Old Brewery in Wokingham Berks and caught 'the lace fever' for which there is no cure. She took to bobbin lace like a duck to water and it was not long before Nenia asked her to take over the class at Wokingham as she had been invited to South Hill Park Arts Centre in Bracknell, Berks to take up the position of Craft Co-ordinator where once again Catherine was asked to teach the bobbin lace. Nenia was invited to tutor a City & Guilds Creative Textile course at Windsor and Maidenhead College where Catherine enrolled in 1978 on the two year course which encompassed everything that made a textile i.e. tatting, spinning, weaving, knitting, crochet, sprang, bobbin lace, netting, tapestry weaving and needlelace . She also learned how to do tablet weaving, how to card a fleece, which was then knitted and woven into cloth, tambour work, sans blas and many other things now long forgotten. Jan Beaney was the tutor for the design work and it was an intensive two year course with a written exam at the end. She successfully gained her certificate in 1980 and this course was her introduction to needlelace. Catherine excelled in needlework at school and would love to have attended The Royal School of Needlelwork as an apprentice but her teacher told her parents that it was hard work and poorly paid, so she had to drop needlework and take the Commercial course of shorthand and typing. You can imagine how honoured she felt several decades later to be invited by Joan Field who was Principal of The Royal School (at that time located at Princes Gate in London), to teach the apprentices one day a week for six weeks. Catherine is a qualified teacher for Adult & Further Education having attended a course at Brooklands Technical College, Weybridge in 1988 where she was awarded a Certificate for part-time Teaching Of Adults by the Regional Advisory Council For Further Education. Catherine went on to teach needlelace at The English Lace School, Devon from 1982 until it's closure, The British College of Lace Rugby, workshops for The Lace Guild including Summer School at Ford Castle, also workshops for groups throughout the UK. She has taught several times in Northern & Southern Ireland, been invited to Los Angeles, Ithaca, Puerto Rico and a Caribbean Cruise, Indianapolis, San Diego twice to Denver, OIDFA Nottingham University 2002, Bourg St Andeol Southern France 2004 & 2005, C & G at Knuston Hall and the very first intake of C & G students in the 1980's at Camberley Adult Education Centre, Surrey. She was one of the three Assessors, along with Susanne Thompson and Ann Collier, appointed by the Lace Guild for the 'Guinea Pigs' who sat the very first City & Guilds Lace Exam in September 1987 and subsequently became C & G tutors themselves for the new C & G Lacemaking course. In 2007 she was invited to teach in Perth for the Australian Lace Guild, moving on to Melbourne for the Embroiderers' Guild and finally Sydney, to teach at the 50th Anniversary of the Sydney branch of the Embroiderers' Guild, which was held at the Olympic Showground. South Hill Park Arts Centre, Bracknell early 1980's , The English Lace School, Devon, The British Craft Centre, Earlham St, London, 'FIVE CENTURIES OF LACE', West Surrey College of Art & Design, The Towner Gallery, Guildford, Surrey, Guildford House Gallery, Surrey. 'ART IN ACTION', Waterperry House, Oxford, OIDFA INTERNATIONAL LACE FESTIVALS in Bruges, Brighton & Finland. As a member of The Westhope Group - 'LACE MAKER AS DESIGNER' - Pilkington Glass, Lancs 1993, Farnham Museum, Surrey 1994, Cancentrum Bruges 1994, Rougemont House July, 1994, Smith Art Gallery, Stirling, Scotland, Aug 1994. 'CAUGHT BY A THREAD' - Central Museum & Art Gallery, Northampton Aug - Sep 1999, Luton Museum 1999/2000, Harrogate 1999/2000. Sansepolcro BIENNALE, Italy, 1994,1996,1998, 2000, 2002, 2012. Lace Guild 'SEVEN' 2007'. 'NATURE IN ART' Twigworth, Gloucester 2008. 'EMBRACING LACE' - Whitchurch Silk Mill, Hampshire 2008. 2013 - THE NETHERLANDS, GERMANY. Catherine was also a member of the Westhope Group which was formed shortly after the Lace Guild's 'Guinea Pigs' examination for the City & Guilds Lacemaking course. A few successful candidates were invited to join the group, with numbers limited to the number of beds available at the college! Some of the very well known and highly respected tutors/authors namely Cynthia Voysey - Honiton, Barbara Underwood - Bedfordshire, Carol Williamson - Needlelace, Margaret Clark- who was instrumental in setting up the C & G Lacemaking course, Dorothy Swinson, Jane Rushworth, Sue Goodman - Chair of the Lace Guild, Lauretta Clark - Honiton, Deborah Robinson - Lace Guild Editor, Gil Dye, Tessa Holmes, Sue Willoughby, Angela White, Ann Wheeler, Anne Dyer - Principle of the College, Susanne Thompson - Honiton (later awarded an OBE), Ann Collier - Contemporary Lace and who has gone on to produce in excess of 150 fans, were all members of the group at this particular time. 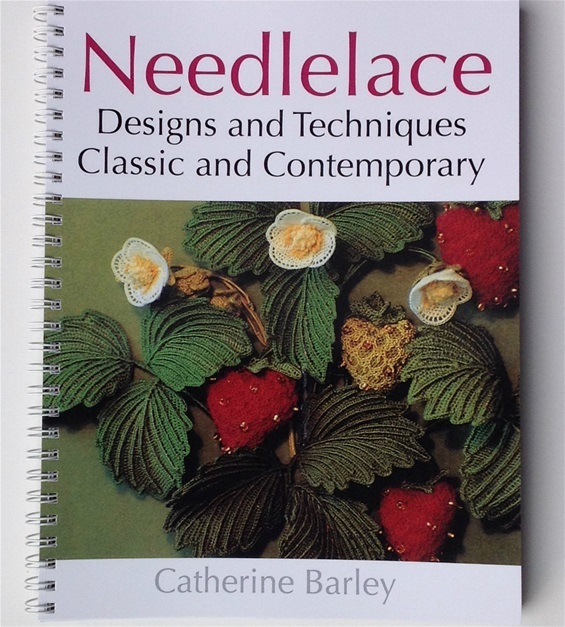 In 1986 Catherine co-authored 'Venetian Gros Point Lace' with Nenia Lovesey - published by Dryad Press and was commissioned to write a book by B T Batsford on Needlelace, which was first published in October 1993, re-printed 1995, reissued 2001, re-printed 2002, and 2003. Having been out of print for eleven years 'NEEDLELACE DESIGNS & TECHNIQUES IS ONCE AGAIN AVAILABLE AS A PRINT ON DEMAND EDITION, SPRIAL BOUND PRICED AT £26.50P. DETAILS ON HOW TO ORDER CAN BE FOUND ON SALES/ORDERS. Catherine dedicated her book entitled Needlelace Designs & Techniques - Classic & Contemporary' to Nenia Lovesey her teacher and friend, whom she says she can never repay for giving so generously over the years, of her time, knowledge, enthusiasm, encouragement and for enriching her life. With the help of colleagues and friends, Catherine was able to donate the sum of £1,512 to Breast Cancer Campaign in memory of Iris Wallbank who was sadly a victim of breast cancer, from money raised from the sale of greetings cards printed of her 'Parasol for Iris' (For more information about Iris visit 'MY GALLERY'). She says also that she has done her best over several decades to continue Nenia's work by introducing and teaching others to this sadly neglected but most beautiful form of lace, in the hope that her many students will also pass on their knowledge for the benefit of future generations.